Shortly after midnight on 26th.November 1939 the "Charles Livingston" ran aground in heavy seas during a WSW gale. Her crew radioed for help and gave their position as "Ashore" between the Bar Lightvessel and Great Orme's Head. The Rhyl, Hoylake & New Brighten No.2. lifeboats were called out and made a thorough search of the whole North Wales coastline, but could find no trace of the vessel. The missing Pilot Boat was eventually found many miles away, on Ainsdale Beach, six men were rescued from her by the Blackpool lifeboat. The crew of the Pilot Boat, because of squalls of heavy rain, they had lost sight of the Bar Lightvessel and for over three hours steamed slowly ahead trying to ascertain her position. At 3.30am she went aground and radioed for urgent assistance, giving what they thought to be their position. At 8,o'clock that morning, with Waves breaking right over them, the crew of the Pilot Boat soon discovered in the growing light that they had in fact, gone ashore on Ainsdale Beach. The Lytham & Blackpool lifeboats put out to her, the six survivors aboard the Pilot Boat refused to get into the Lytham boat, saying they would try and walk ashore, as the tide was ebbing, however at 2.00 o'clock in the afternoon, they took up the offer from the Blackpool boat, and the six were landed on the nearby beach. Prior to this tragedy, on 5th.April 1939 she had been in a collision with the Swedish steamer "Kalix" of Stockholm, off the Alfred Dock Birkenhead in foggy conditions, the Kalix with her port bow damaged, docked at Birkenhead, while the "Charles Livingston" with stern damaged, docked at Liverpool. "Charles Livingston" Pilot Boat No l. 145885, GZCN. 434 gross tons. 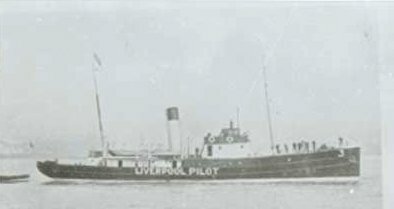 Built Port Glasgow l921, 144.9 x 27.7 x 12.7. and owner and operated by the Mersey Dock & Harbour Board Liverpool. "Kalix" steel Sc Steamer, built at M'Bro in l913. 5401. SLQA. 2,801 gross tons. 310.0 x 46 x 21.6 Owner Trafikaktiebolget Grangesberg Oxelosund, Stockholm, Sweden. Records shows with reference to 26th Nov, The Blackpool Service boat the "Sarah Ann Austin" as saving six. During her mission, she had been struck heavy sea and almost capsized two of her crew were washed overboard, they were fortunate in being hauled back board.